Sophie Lockett joined the Barbican Piano Trio in 2009. She enjoys a diverse performing career playing with a plethora of orchestras including the London Chamber Orchestra, the London Contemporary Orchestra and the London Symphony Orchestra. Sophie is regularly invited to perform as guest principal 2nd violin with the Royal Philharmonic Orchestra, the Royal Northern Sinfonia and the English Chamber Orchestra. She has performed concertos with York Musical Society, Arad Symphony Orchestra, Oxford Symphony Orchestra and York Young Soloists Chamber Orchestra which she now directs. Sophie leads Albert’s Band, the Royal Albert Hall's education ensemble, giving themed concerts and workshops for children. She performs in concert, on recordings, in music videos and on television with artists including Frank Ocean, Bastille, Mcfly, Alison Moyet, and John Barrowman. Sophie gives solo and chamber masterclasses, teaches at the Junior Academy and coaches on Junior MusicWorks, Pro Corda and Yorchestra courses. She was awarded a scholarship to The Purcell School at the age of twelve where she studied with Erik Houston, continuing her studies with Yossi Zivoni at the Royal College of Music assisted by Foundation and Leverhulme Scholarships. Robert Max enjoys a career that weaves together the threads of solo performance, chamber music, conducting and teaching. He has given recitals throughout the UK, Europe, Russia and the USA and performed concertos with the BBC Concert Orchestra, London Mozart Players, English Sinfonia, Arad Philharmonic, Wren Orchestra, Kazakh State Symphony Orchestra, Covent Garden Chamber Orchestra and many others. Robert has been the cellist of the Barbican Piano Trio for thirty years, is an Associate of the Royal Academy of Music where he has taught at the Junior Academy since 1992, and has coached chamber music at MusicWorks since its inception in 2001. He is an Honorary Professor of the Rachmaninov Institute in Tambov in Russia, a member of the International Board of Governors of the Jerusalem Academy of Music and Dance, President of the North London Festival of Music, Drama and Dance and Artistic Director of the Frinton Festival. Robert is the principal cellist of the London Chamber Orchestra, conducts the Oxford Symphony and the North London Symphony Orchestras and plays a Stradivarius cello dating from 1726 known as “The Comte de Saveuse”. 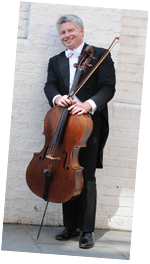 As a soloist and chamber musician James Kirby performs regularly throughout the UK and Europe. He has made appearances at major concert series in France, Belgium, Germany, Italy, Holland, the Czech Republic, Bermuda, Hong Kong and Malaysia. In the UK he has performed at Wigmore Hall and in the Edinburgh and Aldeburgh Festivals. While studying at the Moscow Conservatoire James reached the semi-finals of the International Tchaikovsky Competition. Highlights of his regular visits to the former Soviet Union include performances at the Sakharov Festival in Nizhny Novgorod and the Omsk Festival. He has performed concertos with the Moscow, Khazakh and Belorussian Symphony Orchestras, the Arad and Oradea Philharmonic Orchestras in Romania and the English and Scottish Chamber Orchestras. James has performed with the Vanburgh Quartet, the BBC Singers, Lydia Mordkovitch and the mezzo soprano Sarah Connolly and has made several recordings for Chandos. As a dedicated teacher, James holds posts at the Royal Welsh College of Music and Drama and at Royal Holloway, University of London. He is Artist in Residence at the University of Hull and is an Honorary Professor at the Rachmaninov Institute, Tambov, Russia. James has served on the Juries of international piano competitions in Romania, Latvia, Russia and Slovenia and gives masterclasses in the UK and overseas.